Wondering what’s possible after the losses that come with a shifting faith? Missing God after a faith deconstruction and longing for ways to engage spiritually again? Tired of being angry at the church and ready for something new? Wanting to develop some fresh spiritual practices? Longing to use your gifts to and passions to create more love, justice, and beauty in the world? Hoping for a safe space to share with other kindred spirits who are trying to find their way in the spiritual wilderness, too? 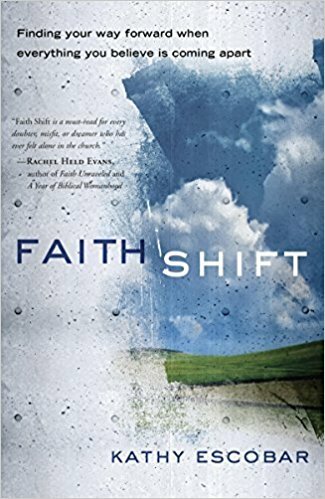 Join Kathy Escobar, author of Faith Shift: Finding Your Way Forward When Everything You Believe is Coming Apart, and other church burnouts, spiritual refugees, and freedom seekers, for a new 6-week online course hosted by The Work of the People. This online class is for men and women of all ages and experiences who know the pain and loss of a faith deconstruction but are beginning to be open to new possibilities on the other side of it. * A facilitated and interactive online class experience that allows for group members to share freely and safely. * Videos and reflection questions by Kathy Escobar to launch discussion and engagement with the material each week. * Ability to engage around your own schedule at any time, based on any time zone or availability. * Practices, resources, exercises, and links to other Work of the People videos. * If can't afford the course, let us know, we don't want the cost of the course to keep you from the space and journey. Also, proceeds go to The Refuge, Broomfield, CO. So that's pretty cool. Is the "sign in" info the same as my TWOTP account? No, this is a new account with the e-course platform Thinkific, so you'll need to sign up and in with new account info. NOTE: In the near future, the Thinkific e-courses will be integrated into the TWOTP site, so at the point, you will sign in directly to TWOTP to access e-courses. What if we don't think you are the devil for charging money for the course, but just aren't in a position to pay a portion or even the entire cost or the course? Kathy Escobar co-pastors at The Refuge, a Christian community and mission center in North Denver and is the author of Faith Shift: Finding Your Way Forward When Everything You Believe is Coming Apart, Down We Go: Living into the Wild Ways of Jesus and several other books. A trained spiritual director, speaker, writer, group facilitator, and advocate, her passion is for those on the margins of life and faith and creating brave, safe spaces for healing and transformation in community. A Pepperdine University graduate, she has a Master’s in Management with an emphasis in Organizational Development from JFK University and a Certificate in Spiritual Direction from Denver Seminary. She blogs regularly as well as writing for Patheos Progressive Christian Channel and Sheloves Magazine, and creating content for The Work of the People. A percentage of the course proceeds will go to the Refuge, a Christian community and mission center planted in Broomfield, Colorado in 2006, so that's pretty cool.